It is a quintessential American diner. As you come up the escalator into the children’s toy section, your ears are met with good old classics that play through the air, turning your attention to the 50’s diner hidden behind all these toys. You wouldn’t find this place by chance, you’ve got to be lured to it. Once you’re in, it’s like being in a time warp. 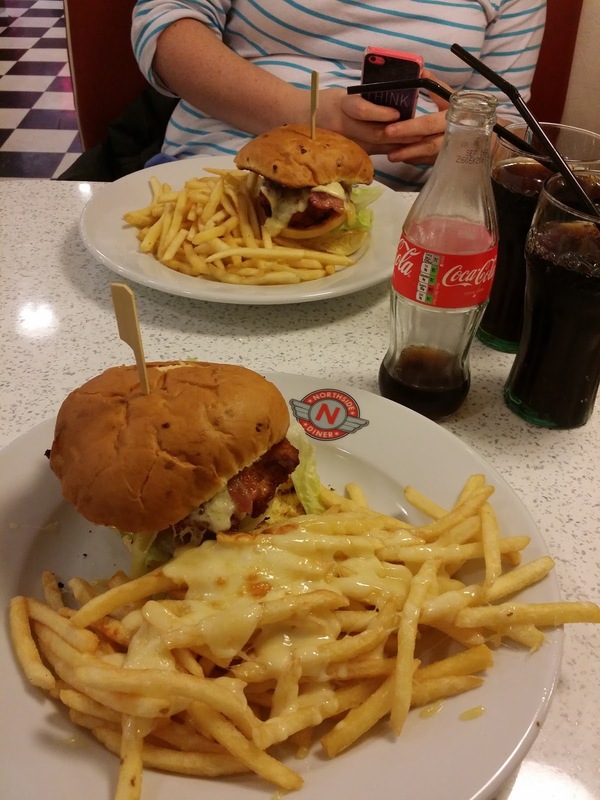 After seeing an advert and asking about, I was convinced I needed to visit the Northside Diner. We headed in looking for some filling lunch after a morning of seminars and lectures and we were greeted with plates that brimmed with American servings of quality food. 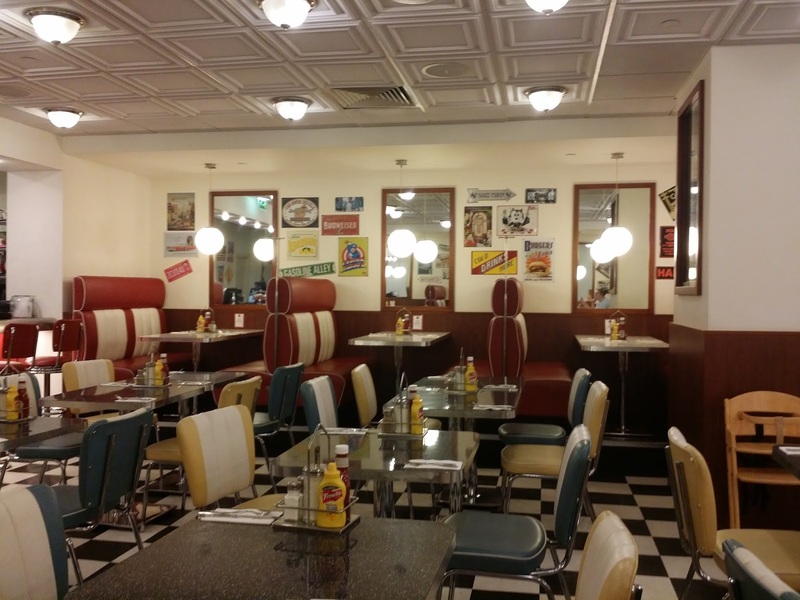 The diner is filled with 50’s style red and white booths and metal tables. 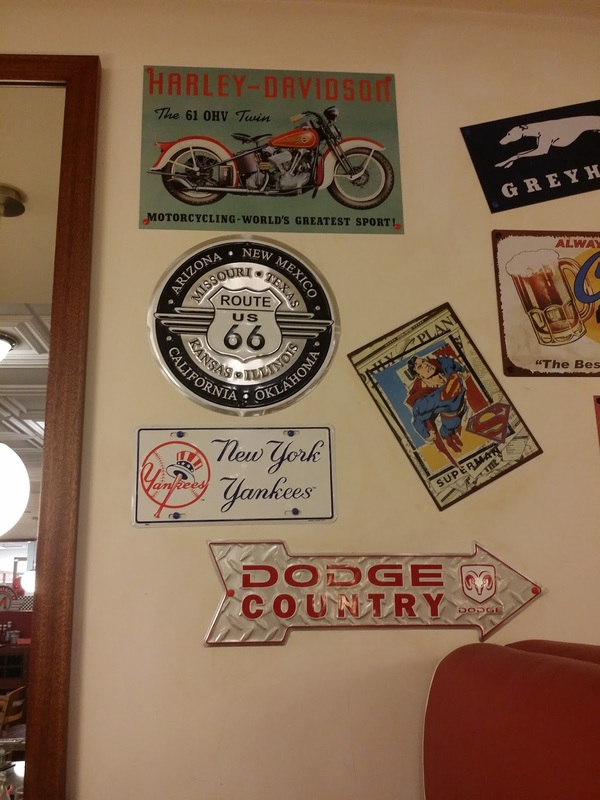 Retro adverts adorn the walls and the American flag is everywhere. You can’t help but almost dance to your table and during your meal from the music coming from the jukebox. A smorgasbord of American classics jump out at you from the menu, begging to be eaten. Burgers, hotdogs, stacked sandwiches, milkshakes, waffles, pancakes, cheesecake, ribs, wings. It was almost too much to choose from! Your mouth waters just reading the menu. Most items on the menu are under £10 so eating out here is quite wallet-friendly. So naturally, we dove in and went straight for a starter. First up a serving of Chicken Wings with Cilantro ‘Slaw on the side. They were sweet, sticky and to be honest, I could have had a larger serving of these as my main. The ‘slaw was interesting to me, not really my favourite thing to eat but I tried it anyway. 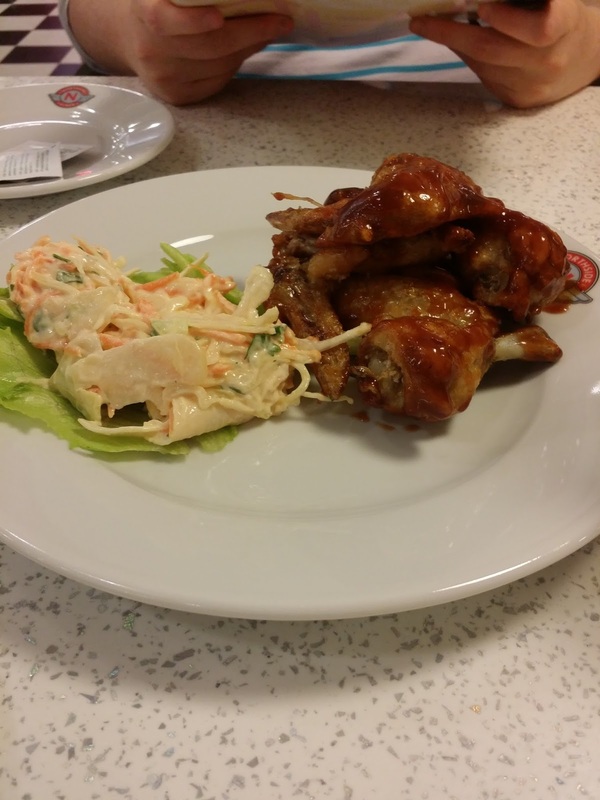 I was so glad I did, it was delicious and gave a lovely change in crunch and texture and sweetness to the ribs. Next up, we opted for the same thing again. The chicken burger melt. A delicious, juicy chicken breast topped with crispy bacon and melted Jack cheese. I also ordered a side of cheesy chips and a Coke. To get the full American experience. I was quite pleased to be given my Coke in a classic glass Coke bottle. It’s nice to see a restaurant (or diner, in this case) pay such attention to detail. I was besotted the moment my food arrived. 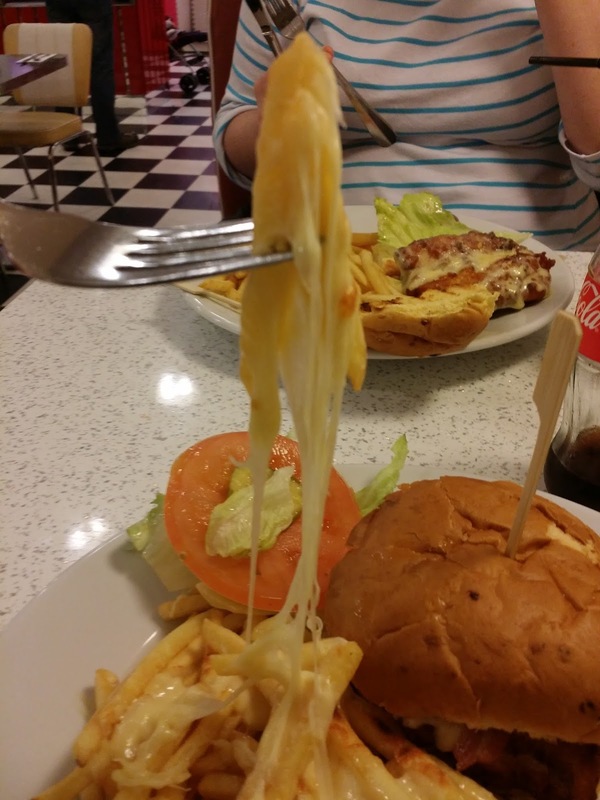 The smell of the cheesy chips made me so hungry and eating them started a bit of a food obsession for me. 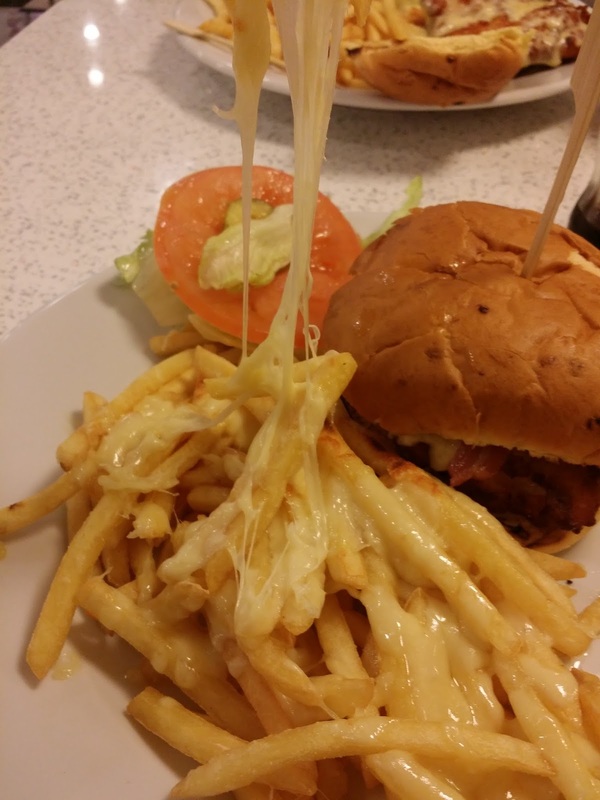 I think I had cheesy chips three times that week after this meal. The burger itself was massive, taking up half of the plate. The bun cracked as I held it and the cheese oozed over the bacon and chicken wrapping them up in gooey goodness, making each mouthful a mixture of flavours. The burger was moreish, juicy and completely filling. The chips filled half the plate and never seemed to diminish as I chomped away. The portion sizes truly live up to the portion sizes I’ve received in America. We were so full at the end of this meal, we couldn’t even contemplate an American classic dessert like cheesecake or waffles. Although I do now have it on good authority from a second trip to the diner that the cheesecake was delicious. The servings were gigantic. We physically couldn’t finish our meals, but we were so full and had enough time to relax and enjoy having a catch up chat that we had plenty of time to enjoy our meal, and we weren’t rushed out of the door when we finished so it made for a pleasant, fun atmosphere. With typical American customer service, we were waited on hand and foot when we entered. Nothing seemed too much! Everytime our server passed us, he would ask if we needed anything. The customer service was brilliant. 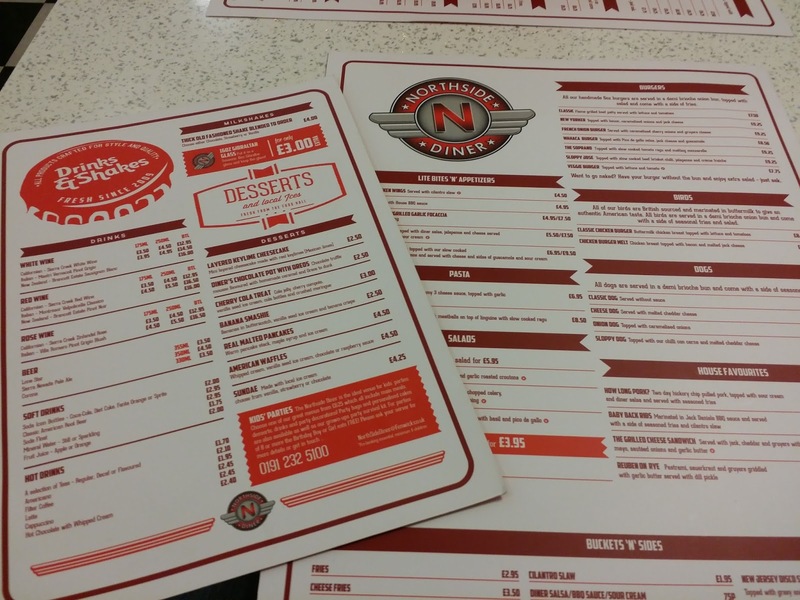 Overall we had a really lovely afternoon at the Northside Diner. The food, the customer service and the final price made the experience very pleasant. 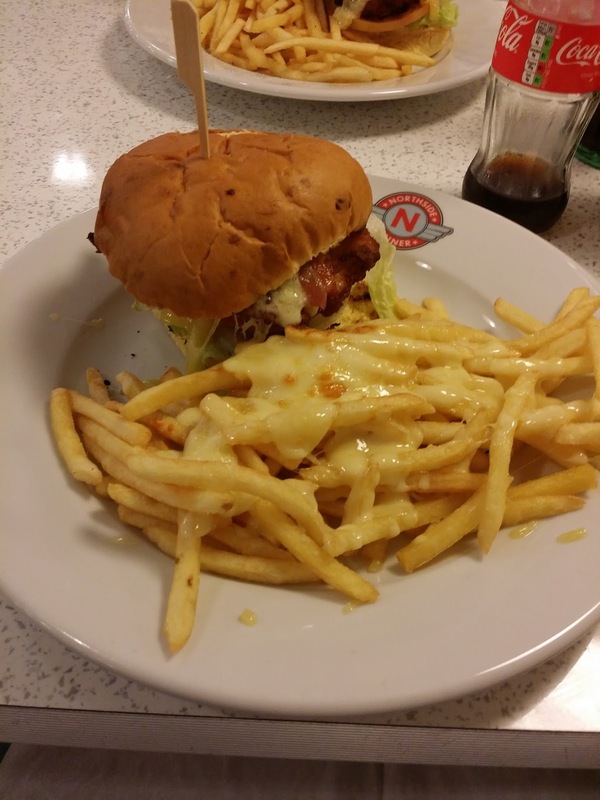 I will definitely be returning to the Northside Diner in the future. 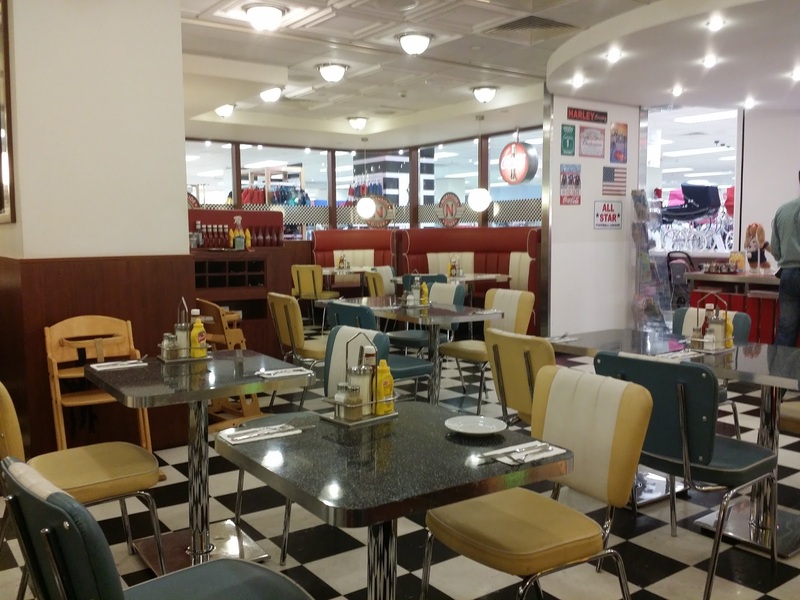 It is a perfect place to hang out with friends and pretend you’re back in the 50’s or to go out to on a cute date with your partner and share a milkshake together!